Kershaw Ion Throwing Knives 1747BWRX. 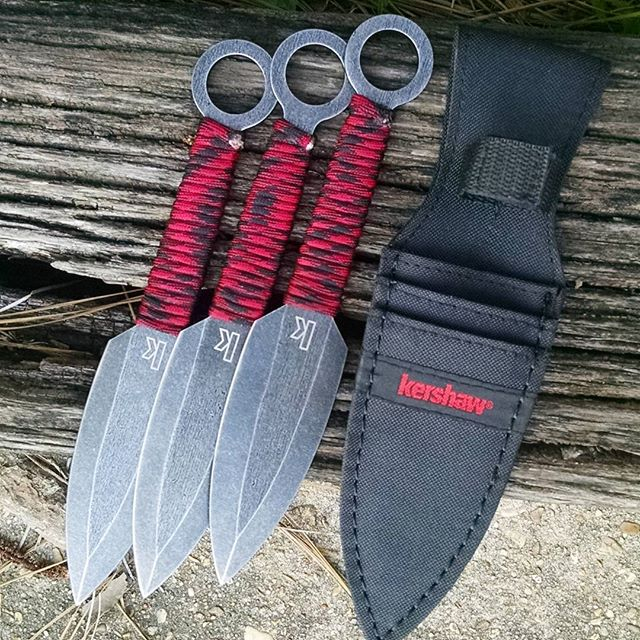 This is a set of three throwing knives and one nylon sheath that fits them all inside. A red and black nylon paracord wraps the handle of each knife. There is a large circle opening on the end of each handle for easy gripping and carrying. The blade is made of 3Cr13 Black Oxide Black wash Finish and is 4.5 inches. Overall length is 9 inches. The handle is also made of the 3Cr13 steel, but can not be seen under the red and black paracords. This is a double edged blade. The Kershaw Ion- go get you some! The red is out but we do have the black and white paracord still in stock, so either order on that number or if you order the red, then black and white color will be sent out 1747BWX.